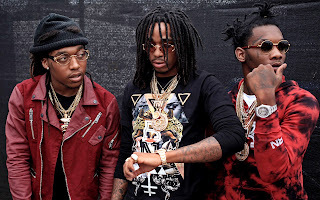 RAW HOLLYWOOD : MIGOS DROPS NEW VIDEO FOR "COCOON"
MIGOS DROPS NEW VIDEO FOR "COCOON"
BET made the announcement via Twitter that Migos had dropped their video for "Cocoon" on 106 and Park. Of course this announcement sent Migos fans through the roof with excitement. The rap trio didn't do much stunting in the video, minus the super dope furs that they rocked. Of course there was eye candy present, who were wrapped in cocoons, in a partially furnished mansion. This song is one of the singles that will be featured on their upcoming album No Labels 3, along with hot song "Say Sum" .